A Major General said the hampering of Ethiopian troops withdrawal from the Ethio-Eritrea border by locals in Tigray was unconstitutional and called on the government to take measures against those who hatched the illegal act. 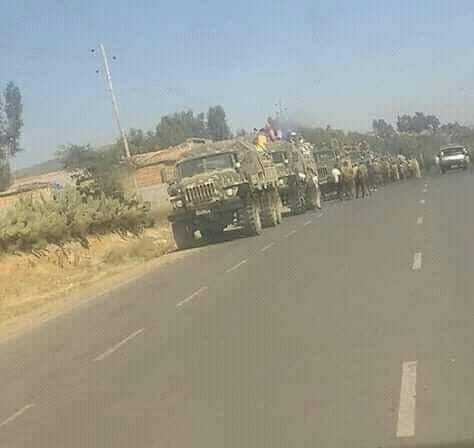 Locals in Tigray yesterday blocked a convoy of Ethiopian troops withdrawing from the Zalambessa front demanding that a replacement army should arrive before withdrawal by the existing troops. Ethiopia and Eritrea have been withdrawing their troops from border areas following a peace declaration signed in July that ended two decades of enmity. In April 2018, a new Prime Minister in Ethiopia accepted a two decade old decision by a boundary commission that was set up to resolve disputes over territories. In a brief interview with ESAT, Major General Melaku Shiferaw, a former director of intelligence and analysis with the Ethiopian defense said the move by the locals was a serious violation of the constitution which clearly stipulates that the army would only take orders from the Prime Minister and his defense chief of staff. The Major General said he believed the blockage of troops withdrawal by the local people was a result of conspiracy by elements in Tigray that stood against the ongoing political reforms in the country. “It was an attempt by those elements in Tigray to sling mud at the peaceful relationship between Ethiopia and Eritrea. There is no reason to keep troops at the border when there is no threat from Eritrea,” Maj. Gen. Shiferaw told ESAT. “These elements were deliberately spreading false rumours that Eritrea would invade Ethiopia,” he said adding that “the elements were also trying all tricks to keep hiding in Tigray to run away from facing justice for the crimes they had committed” in the administration prior to Dr. Abiy Ahmed. The news was first broke by the BBC Amharic Service in Ethiopia that quoted sources as saying that the action by the locals was prompted by the recent directive by Eritrea for a strict vetting of people crossing at two border checkpoints. The new vetting process by Eritrea was not officially announced by its government, nor by the Ethiopian side. Asked to comment on the issue, spokesperson for the Ministry of Foreign Affairs of Ethiopia, Meles Alem said last week in Addis Ababa that his Ministry “had no information” on the new development. Following the peace declaration signed in July, the two countries opened their border, withdrawn their troops and resumed diplomatic relations. The Tigray People’s Liberation Front (TPLF), the party in power for 27 years until it was defeated in March by reformists led by Abiy Ahmed, had stood against political reforms and frowned upon improving relations between Ethiopia and Eritrea. Ante Wesfatam, drop my name from the list. What is it with you guys and WESFAT, is it something that is widespread, an epidemic? Are you infected? I hear from some of my friends who are medical doctors that WESFAT can infect the brain and make those infected behave in strange and bizarre ways - making them appear stupid and irrational and cruel and so on and so forth. Brain WESFAT infections or infestations are especially prevalent - I was informed - in those who are TPLF sympathizers, apologists, and their gofers as well as other narrow tribalists and tribal terrorists, warmongers, mischief makers and the like. Some of those in this form that are highly likely to be infected by this disease include Ethoash aka Ashtray or Asswash (this is also the name for another bizarre creature aka Awash), Humera Boy, Thomas H, Halfi Mengedi, and the others is especially interesting - as such, they seem to have very serious infection of WESFAT in their brain. And there is this particular megalomaniac, narcissistic idiot who goes by the name AbebeB who used to have the name Axumai or something who seems to have a rather serious case of WESFAT in the brain - he doesn't seem to have any brain left, his entire brain seems to consist of WESFAT - nothing but WESFAT - judging by the stupidities he posts nonstop in this form. Anyway, coming back to you, Masud, I don't really know if you have the infection yourself but there is cure for the condition and it begins with awareness of the illness. Some of the sick idiots in this forum might not have the wherewithal for procuring a cure, so we might need to help them out in some way. . .
Well, first, we need to identify all of them . . . So, what do you think Masud?